View of Commercial Avenue, Cairo, a few feet from where Will James was lynched. November 11, 1909, Cairo, Illinois. 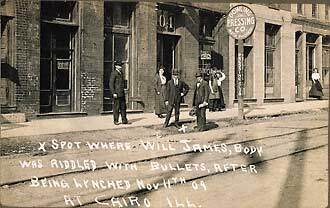 Etched into negative: "X spot where Will James, body was riddled with bullets, after being lynched Nov 11th 09 at Cairo Ill." Ink inscription on reverse: "This Picture is taken from the NE Cor. of 8th and Commercial Avenue Nov1109." Addressed to "Mrs. Jake Petter, 2057 Broad St, Paducah Ky."